The crack of the bat, the pop of the ball as it is caught by the first baseman and the roar of the fans all conjure up images of days gone by with Americans’ favorite pastime: baseball. 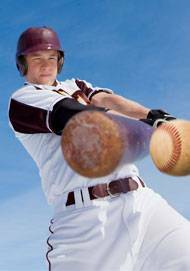 But with the excitement of hitting your first homerun or catching your seasons first fly ball come some risks to the players’ vision. Those cowhide spheres are hurled at speeds equal to or greater than the speed limit of your local expressway. An errant throw or missed catch could spell serious vision impairment or loss. Sports are the leading cause of eye accidents among children and adolescents. Did you know that eye injury puts a person at risk for developing eye diseases later in life? This school year tens of thousands of youngsters will be hit in the eye by a ball or stick, suffering detached retinas, corneal lacerations, cataracts, hemorrhages, and even the loss of an eye. The most hazardous sports are basketball, baseball, hockey, football, lacrosse, racquetball, and soccer. Basketball carries the added risk of eyes being poked by fingers and elbows. Each sport now has it own protective gear that does not interfere with performance. In the NFL and NHL, players use facemasks fitted with shields specially contoured to prevent eye injuries. Coaches, staffs, school administrators, and parents should work together to promote, or even require protective eye gear. These special protective lenses should be placed in frames designed for sports. Standard eyewear frames are not designed to withstand expressway speedballs. Temple hinges can break and cause eye injuries as can the frame, which holds the lens in place. Nobody knows sports vision like Vision Care Consultants. Our doctors have been the eye doctors for the Mizzou Tigers and for the St. Louis Rams football teams. Currently, we are the official eye doctors for the St. Louis Blues. Our doctors know how vision affects all aspects of your game. So from the little leaguer to the major leaguer, if you really want to see an improvement in your game, make an appointment with the sports vision professionals whom the professionals trust. Contact Vision Care Consultants for information about specialty eyewear for all sports.